﻿ It’s not often I get to attend a movie premiere. And it’s not often I get to indulge a movie about abortion. So you can imagine my surprise when I stumbled upon a Facebook event promising both right here on campus. 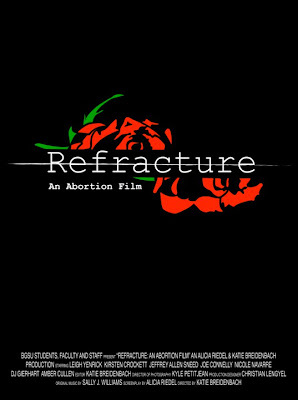 And “Refracture: An Abortion Film,” was offering itself as the obvious answer. Paired with an ambiguous title, the 20 minute exchange of ideas enticed students and faculty the same way popular motion pictures lead viewers to the box office—pandering to their curiosity. Anyone with access to a dictionary could tell you “Refracture” means “to alter by view through a medium.” And that is precisely what filmmakers Katie Breidenbach and Alicia Riedel were attempting to do. But “refract” can also mean to deflect from a straight path. And that would be a more accurate description of what happened in the Union theater Sunday evening. Whether the film’s original vision was political, spiritual, artistic, or something entirely different is unknown. Perhaps it aspired to be all that and more. The opinions expressed were those of individuals “sharing their professional and personal experiences with abortion in the United States.” For those who wanted to gain insight and reach an understanding, it seemed like a great jumping off point. 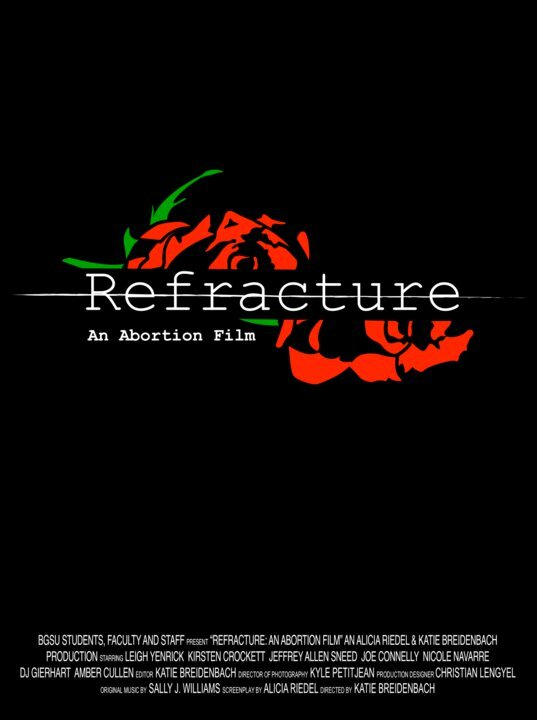 Using the exact words of nearly thirty real people, Refracture: An Abortion Film breaks open the abortion debate as never seen before. Seven actors strive to accurately portray this multitude of opposing perspectives on abortion and, confined to a single room, begin a crossfire of intense dialogue that illuminates one of the biggest controversies of our time. All that’s left is to listen. I’m frequently writing about reproductive rights and abortion has reached a fever pitch. Citizens and lawmakers have divided the country into teams supporting life or choice, labeling the opposition inhumanely against whatever it is that they themselves are advocating. There’s no space for civil dialogue, just confrontation in the form of public protest. Breidenbach and Riedel took on an ambitious project and I applaud their efforts. In fact, I would support a real discussion where perspectives similar to the ones they represented came together and talked through their differences. But this film quickly confirmed what the skeptics had known all along. Representations of abortion are difficult and tend to justify the beliefs of their creators, whether they mean to or not. “Refracture” focused on emotional responses rather than factual information, so I hesitate to call it a documentary. Each monologue is layered in such a way that no character actually addresses the other’s concerns. And misconceptions hang in the open completely unchallenged. Breidenbach and Riedel never claimed to be journalists. They made no promises to investigate the testimonies they gathered. However, there were several factors, perhaps unintentional, pushing this movie further from objective observation and closer to blatant propaganda. The imagery affiliated with the film was a broken flower split in half, torn in two different directions. Flowers are often used as a metaphor for women’s sexual purity and this could be seen on the screen as well as the program. Additionally, the duality suggests an either/or decision, over-simplifying a very complicated issue. If pulled in one direction, you support abortion. If pulled in the other, you are opposed. Middle ground is non-existent. Beyond these elements, the presentation of the perspectives seemed to lean in a particular direction. Referring to a pregnancy center volunteer as a “nurse” gave a religious entity medical credentials she simply doesn’t have. The website for Toledo’s pregnancy center confirms “a laboratory quality pregnancy test” will be administered by “a kind peer counselor”-- not a nurse. In other words, they’d love to talk you out of it—and a positive pregnancy test followed by an ultrasound is just the way to bully young women into continuing an unwanted pregnancy. Meanwhile portrayals of the “pro-choice” voices became overly-dramatic and stereotypical. While their opponents remained cool, calm and collected, those advocating women’s rights were excitable caricatures as seen through the eyes of the “pro-life” movement. And their quotes were extracted in such way that it was unclear who or what they were talking about. As one abortion proponent attempted to discuss clinic violence, it was never mentioned that “they” were the religious extremists attempting to forward their “pro-life” agenda with threats, harassment, and worse. Lastly, suggesting the audience “just sit back and listen” discourages critical thinking, as if this whole mess could been handled in under a half hour. Unfortunately, that was not the case. I’ll be the first to admit personal bias is nearly impossible to stifle. Seriously. I write columns. And again, the directors may not have realized their own viewpoints were dominating their medium. But the notion of real dialogue was a step in the right direction that I wholeheartedly endorse. So I thank Breidenbach and Riedel for thinking outside the box and I would only encourage more meetings of the minds in this heated social arena.